I'm not a big drinker, but I do love an occasional vodkatini, the Cosmopolitan being the prototype. A vodkatini is a cocktail made with vodka served "up" (without ice). It often includes vermouth, liquers, fruit juices, and fresh fruit. Since it's peak blood orange season here in California, I was inspired to create my own cocktail, which I have named a "Blood Orange Vodkatini." The name "Blood Orange Vodkatini" may be more cosmopolitan than a Cosmopolitan. Blood oranges are stunning. Peel back their orange and red speckled rind, and you'll discover a brilliant crimson flesh that is pleasingly sweet and tart. In this Blood Orange Vodkatini, the tangy blood orange juice is balanced by the sweeter Grand Marnier, creating a bright, smooth, and refreshing cocktail. 1. Add ingredients and ice to a cocktail shaker. Shake under your fingers feel frozen. Strain into a chilled martini glass. For more about the history of blood oranges and four more recipes, check out "Blood Oranges: Change You Can Believe In," one of my NPR Kitchen Window pieces from last year. Blood Orange Margarita Cocktail recipe at Wasabimon! I had a blood orange for the first time about a week ago. Unfortunately it didn't come with alcohol. Mmm, 'tis the season. Look luscious! i am coming over chica for a few of these! looks brilliant! I think we need to create some reason to celebrate with a few of these! This sounds great. I love blood oranges! 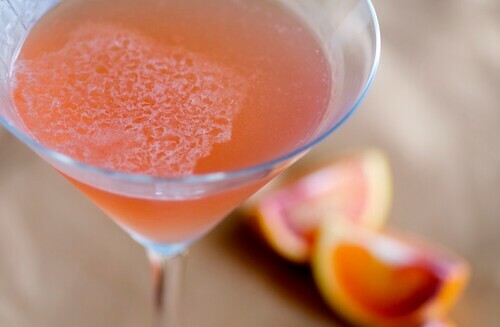 I once had a blood orange margarita, but this martini looks absolutely delicious... and so simple too! val-That is so weird. I just made an olive oil cake with blood oranges last week. The pics are on my Flickr account. It's amazing, isn't it? sues-I had a blood orange margarita once too and loved it. What a great drink. I also love cosmopolitans and this sounds like a great alternative. Thanks for sharing. Also you have a great blog. I LOVE blood oranges. Their juice is just the prettiest color. This is a great cocktail. If I could buy some oranges today, I could make one tonight. I have some Grand Marnier and Vodka at home. Beautiful! I love the name, too.